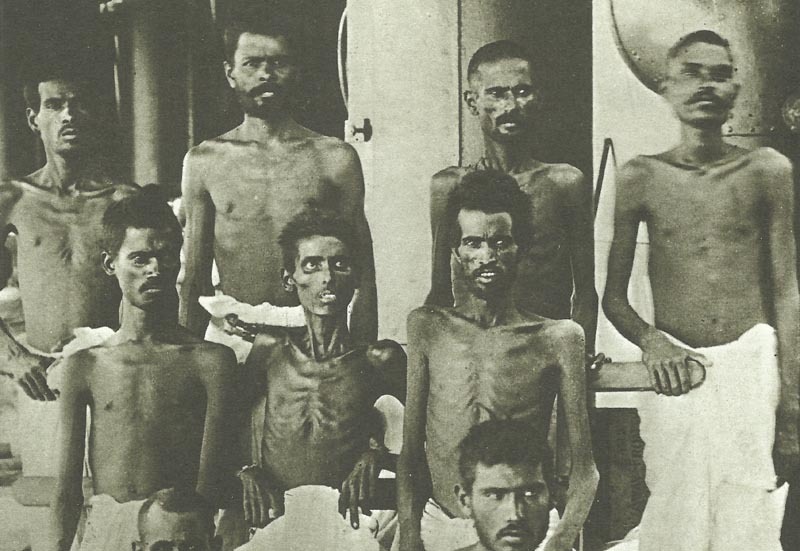 Indian members of the starved British garrison of Kut-el-Amara after the exchange of prisoners. Mesopotamia – FALL OF KUT: 13,309 surrender including 3,248 non-combatants after 146-day siege (with 3,776 casualties). 1,136 badly wounded and 1,450 sick exchanged as agreed with Arab Bureau negotiators. Tigris Corps relief attempt losses total 23,000 men. Persia: Baratov with 5,000 men expels Sevket Bey from Karind after 9-day march (since April 20) to aid Kut. Ireland, Easter Rising: IRB leader Pearse surrenders to Brigade-General Lowe and tells others to do likewise. Verdun, West bank: French gains north of Mort Homme and Cumieres. North Sea: Royal Navy 3rd Battle Squadron (7 ships) transferred from Grand Fleet to Thames (Sheerness) as stronger coast guard. Allied Havre Declaration guarantees Belgian Congo’s integrity. Mexico: ­US and Mexican generals agree withdrawal conditions (until May 3).